If you are looking for the most beautiful beach in all of Greece, and perhaps the world, you will need to take a trip to Myrtos Beach 8km south of Assos on the Ionian Island of Kefalonia in the Ionian Sea of Greece. Located in the north-west of Kefalonia, Myrtos Beach has been called “one of the most dramatic beaches in Greece” and has been voted the best Greek beach numerous times and always shows up on best beach lists in travel magazines. It lies between two mountains, Agia Dynati and Kalon Oros, and is one of the most photographed places in Greece. Myrtos Beach is world-famous because of its beautiful blue and turquoise waters that contrast sharply with the bright white of the smooth marble pebbles of the beach between the limestone cliffs of the two mountains. The beach has a semi-circular shape and stunning scenery. It’s a picture perfect beach and the western coast of Myrtos offers spectacular sunset views. To get to the beach, visitors must go down a steep, winding road about 2km in length from the village of Divarata. On the way to the beach, visitors can enjoy amazing views. During the summer, the Municipality of Pylaros to and from the beach runs a public bus service. 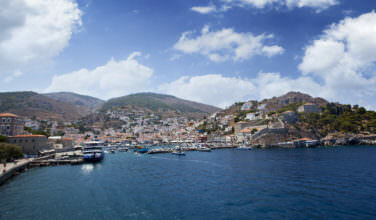 It departs from the harbor area in Agia Efimia. Private cars can park in spots at the base of the cliffs. Because of its beauty, the beach can become extremely crowded in the summer. Beach goers should be advised that the beach drops off quickly and sharply, so the waters might not be the best for small children. The area is also affected by strong winds. The beach has been kept free of watersports and visitors are only allowed to swim in the water. Lounge chairs and umbrellas can be rented on site. A small part of the beach remains completely unspoiled by tourists, ideal for total isolation. 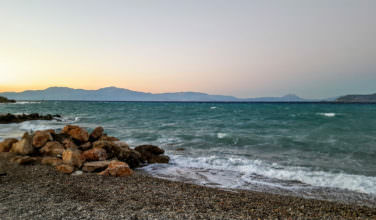 Due to a local ordinance banning permanent structures, visitors looking for dining options will find tavernas at the top of the road leading down to the beach in the village of Divarata where they can also find a beach bar. Nightlife options can be found in the capital of Argostoli. 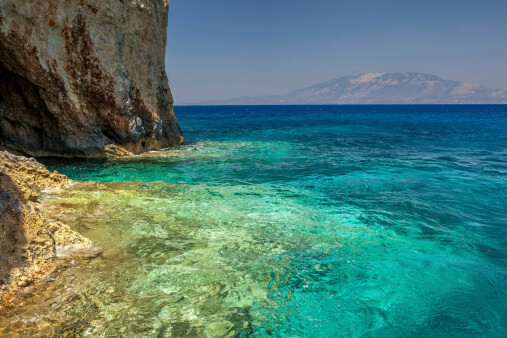 To get to Myrtos Beach from the mainland, Kefalonia is a one-hour flight from Athens. 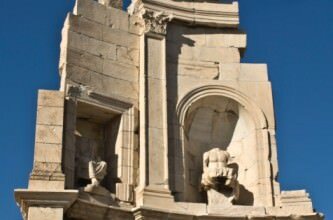 A cheaper alternative (however longer) is to take a bus from Athens to Patra, the Peloponnese capital, and a ferry to the Sami harbor on Kefalonia’s east side.